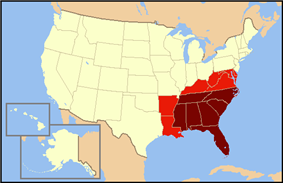 Dark red states are always included in definitions of the Southeastern United States. Light red states are considered "Southeastern" with less frequency. The Southeastern United States, colloquially referred to as the South, is the eastern portion of the Southern United States, and the southern portion of the Eastern United States. Flora Atlas of the Southeastern United States — by the North Carolina Botanical Garden & University of North Carolina Herbarium (NCU). ^ "Florida QuickFacts from the US Census Bureau". Quickfacts.census.gov. Retrieved 2013-12-13. ^ "Georgia QuickFacts from the US Census Bureau". Quickfacts.census.gov. Retrieved 2013-12-13. ^ "North Carolina QuickFacts from the US Census Bureau". Quickfacts.census.gov. Retrieved 2013-12-13. ^ "Business Partnership Opportunities | University of South Carolina". Innovista.sc.edu. Retrieved 2013-12-13. ^ "Jacksonville (city) QuickFacts from the US Census Bureau". Quickfacts.census.gov. Retrieved 2013-12-13. ^ a b "http://www.census.gov/popest/data/metro/totals/2013/". 2013 Population Estimates. ^ Waymer, Jim (September 19, 2013). "Refuge hopes new hunts help big pig problem". Florida Today (Melbourne, Florida). pp. 1B. Retrieved September 19, 2013. East Coast of the United States — the southern Eastern Seaboard portion. There are about two million feral pigs in the Southeast. Around 500,000 are in Florida. ^ a: Jacksonville, Louisville, and Nashville are consolidated city-counties. Therefore the population given is for the entire city excluding other incorporated places lying within the county limits. Research Triangle Park, in the Raleigh-Durham urban area of North Carolina, has emerged as a major hub of technology, governmental, and biotechnological research and development, as has the Virginia BioTechnology Research Park in Richmond. The Cummings Research Park in the Huntsville, Alabama area is the second largest research complex in the nation. 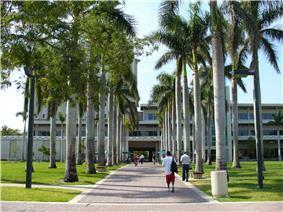 It is one of the biggest areas of aerospace engineering and missile defense technology. Huntsville is also home to Redstone Arsenal, United States Army Missile Command, the U.S. Space and Rocket Center, NASA's Marshall Space Flight Center and many other key government, military, and aerospace agencies. The National High Magnetic Field Laboratory in Tallahassee, Florida is the largest laboratory in the world devoted to the study of magnetism. The University of South Carolina is currently constructing a research campus in downtown Columbia, and the University is the nation’s only National Science Foundation-funded Industry/University Cooperative Research Center for Fuel Cells. The Southeast is home to a number of prominent universities, with several large research universities of longstanding significance which exert influence beyond the region. The predominant culture of the South has its origins with the settlement of the region by British colonists and African slaves in the 17th century, as well as large groups of English, Scots and Ulster-Scots, Germans, French, and Acadians in succeeding centuries. The most populous state in the region was Florida (19,552,860), followed by Georgia (9,992,167), and North Carolina (9,848,060).